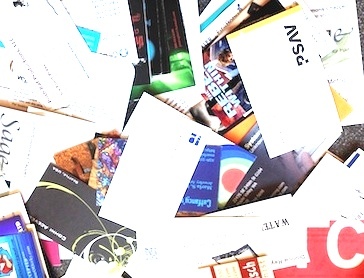 Before you fall in love with your business card — is it readable by an OCR scanner? High-drama design can often result in low impact. Before you commit to a mad, passionate affair with your business card’s design, ask yourself: Is this readable by an OCR scanner? OCR (optical character recognition) software now comes bundled with most home-office scanners. It’s no longer something for the sales person who goes to trade shows and comes back with 500 business cards. It’s for just about anyone who’s tired of the piles of business cards cluttering their desks. I just popped a dozen business cards into my ScanSnap S1500M and was astonished at the results. They scanned in seconds, and in Cardiris software half of the cards transferred most of their data into the correct fields for a vCard that could be exported with one click into my Contacts application. The other half of the cards yielded up no data at all. Zip. Nada. They might as well have been blank. So, do you want to be the graphic designer, building contractor, or editor whose email address and phone number are now in my database? Or do you want to be the one whose unreadable card I just dropped into my recycle bin? In the world of business communications, high drama can easily result in low impact.